Design options – As you’d expect from a leading aluminium systems company, there is a huge range of design options, hundreds of colour options and combinations, and a wide choice of handles. The range of trade products now available from Reynaers are all rigorously tested to offer the highest levels of performance. The SL 68 has industry-leading thermal insulation and is one of the most secure windows available – meeting PAS24 security and Secured by Design standards. This security is enhanced with hinge-side security brackets, a multi-point locking mechanism and lockable handles. Rebecca Cope continued: “The slim frames and clean lines make this window ideal for both contemporary and more traditional properties and what’s more, its 68mm frame depth makes it perfect as a replacement window as it usually fits within the existing plaster line.” The SL 68 can achieve a Window Energy Rating of A++ and U-values down to 1.0 W/m2K with triple glazing. When it comes to double glazing, the Window Energy Rating is A, with a U-value of 1.4 W/m2K. This level of market-leading performance allows fabricators and installers to add real value to their product ranges, resulting in better margins. 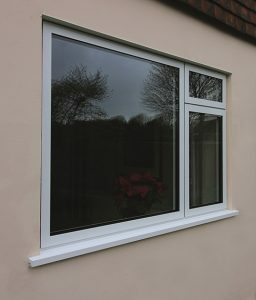 Innovative adjustable corner profiles for bay and bow windows are also possible.